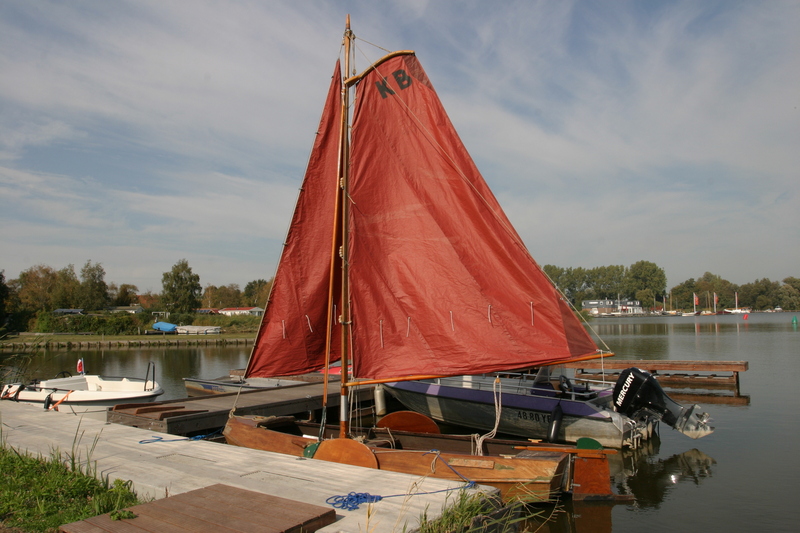 Went to Wormer (North of Amsterdam) to see / sail / pick up the sailing scow and it was a 80% succes. Discovering it was a sturdy hull with nothing but some cosmetic work to be done on it was a good thing. The equipment (mast, boom, sails, lines, blocks, lee boards, rudder, floorboards, fenders, landline etc…) is complete, well maintained and ready to deploy. A few items could do with some t.l.c. still it’s all good and safe to use. The first time rigging her on the water went smooth, knowing we hadn’t rigged this kind of boat before. Sailing the scow was the best part; She’s neutral and polite at the helm, stable as a raft and her 12m² sail provides ample of power to drive her along. Sailing the boat on her home territory – the Zwet lake at Wormer where she was built- on a warm Indian-summer day in October was a pleasure. Later in the afternoon the wind picked up and we had to tack our way back home. Once we realised to kick down the lee board down all the way the scow now well heeled over pointed straight without much drifting . Hiking out doesn’t seem to impress this boat a lot compaired to letting some sail out, so we did the latter and forgot about the hiking. Just sit in it and enjoy the ride. This entry was posted in 14 ft row & sail, La Semaine du Golfe, other fun craft and tagged Ko boot, Random nonsense by ronnydg. Bookmark the permalink.